Once a customer places an order the order is marked with a status of “Placed” and as shop owner you are alerted of the order while they proceed to the payment page. Depending on the payment gateway, the customer may pay for their order and the payment gateway will tell your shop that the payment was made. The order will be automatically updated to “Paid”. If the customers payment fails at the payment gateway the customer will be redirected to your shop and the order will be marked as “Failed Payment”. Details of the Fail are recorded on the order and you can see these on the “History” tab of the order.The order will be available for the customer at the cart again and they can try going through the checkout process again. A customer might get to the payment gateway and then change their mind. In this case the order will be marked as Placed and never updated to paid. If the customer is a:Logged In User – they may return to your site and their order will still be available to them. Guest Customer – their order will not be available if they return to the site because of privacy reasons. You can setup an “Order Status” to is flagged to send an email to the customer once an order is marked with that status. This email can include a private, automatically generated link to the order than the customer can use to view the order and pay for it. Go to “Orders” > “Order Statuses”. Click “Add +” at the top right of the list. Give the status a name. NOTE: this name will be seen by the customer on the details of the order. An order with this status has NOT been paid so leave the Paid box unticked. Mark the order with this status as ‘Open’ for payment by choosing “For Payment” next to the “Open” field. Tick the order as “Active” and also “Send Email”. Thank you for placing an order in our store! [[First Name]] will be replaced by the First Name on the order. NOTE: If the order was made by a User registered on your site, they may access any open orders under their Profile and clicking on “View Past Orders”. 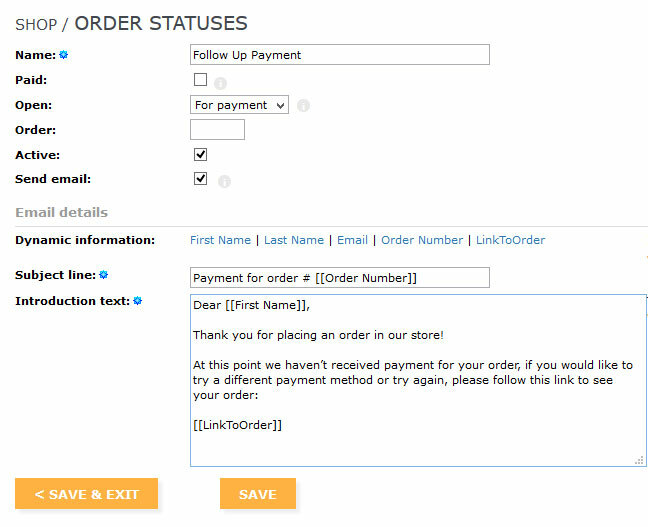 After you have created this Order Status it will be available as a status to save on any Order that you edit. When you mark an order with this newly created status, a button will appear at the bottom of the Edit Order screen that allows you to Save the Order and Email the customer of that order. Pressing this button will update the Order to this new Status and automatically email them the details of the order along with your introduction that includes an explanation and a link to the order. To avoid fraud, it is receommended that you ALWAYS check your payment gateway to ensure received the sufficient funds for the order. An order may be marked as Placed, but not updated to Paid because of the way some payment gateways work, it’s a good idea to double check for payment was made before you email the customer. Your shop provides you with Monthly Sales and Status reports so it’s always a great idea to utilise the order status functionality throughout your shop. If you have any questions or need a hand with configuration. Please contact us!